"A great majority of NIC ice information products are created using the SIPAS editor," explained Mark Denil, a GIS analyst for NIC. "This editing environment handles most of the data shuffling, processing, and housekeeping operations for ice analysts, allowing editors to concentrate on interpreting ice conditions. 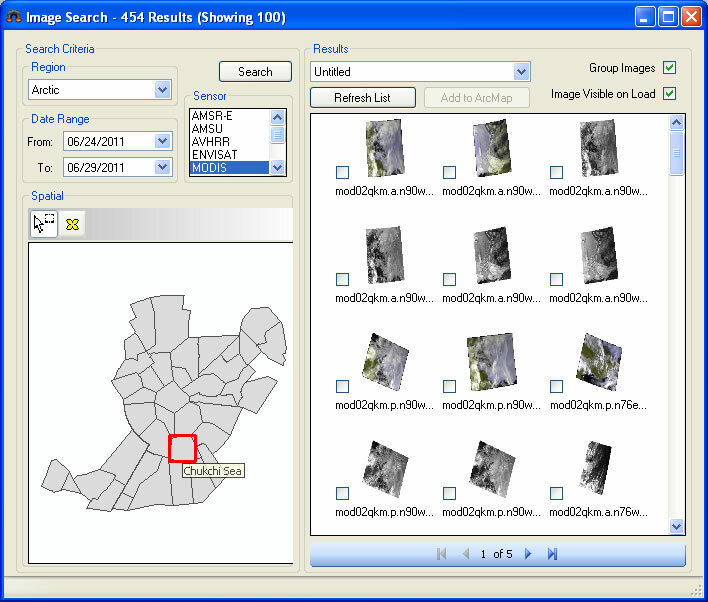 The majority of ice data products are generated out of the enterprise geodatabase." So ships' crews rely on NIC, a cooperative partnership that includes the US Navy, the US Coast Guard, and the National Oceanic and Atmospheric Administration (NOAA). 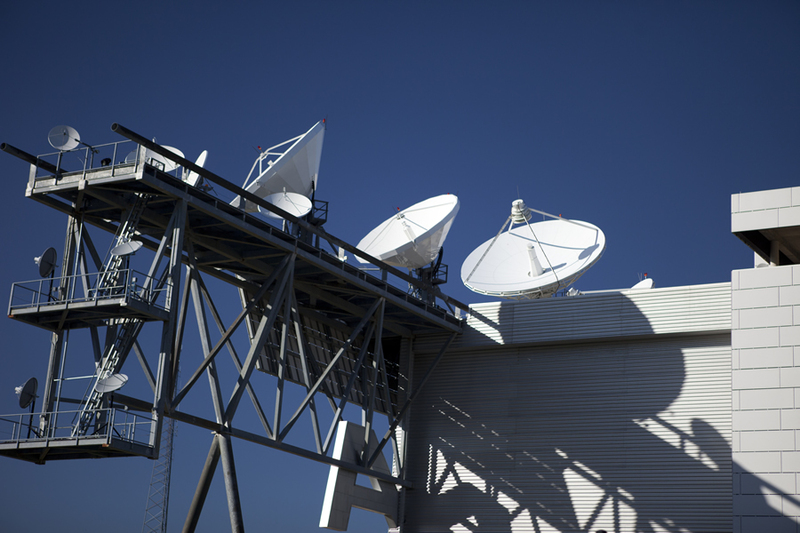 Residing in the NOAA Satellite Operations Facility in Suitland, Maryland, NIC is tucked in a corner of a striking postmodern structure bedecked with satellite dishes. In an operations room, a staff of 15 to 18 ice analysts (most of whom have a background in meteorology) study and interpret ice images. They are supported by small teams of cryogenics scientists and GIS/IT technicians. On a daily, weekly, and biweekly basis, NIC experts analyze data from satellite imagery and other sources to assess sea ice conditions in the Arctic, the Antarctic, the Great Lakes, and Chesapeake Bay. They decipher the various types of ice at the poles based primarily on images from a diverse number of satellites, such as Canadian Space Agency's (CSA) RADARSAT-1 and 2, the European Space Agency's Envisat, and NASA's Terra and Aqua. More than 95 percent of the data used in sea ice analyses is derived from polar orbiting satellites. Every day, the center receives approximately 6,000 images, or roughly 160 gigabytes of data, which automated routines turn into GIS-ready files. 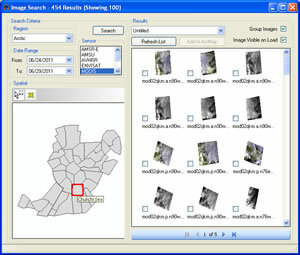 These images are cataloged and made available to individual analysts through a custom imagery browser application. They load their imagery selections into SIPAS. The majority of the analysts' work takes place in this environment. Features such as fractures, leads, and polynyas (FLAP) are also captured. A fracture is a break or rupture in close-packed ice, a lead is a fracture or passageway through sea ice that is navigable by surface vessels, and a polynya is a nonlinear area of open water enclosed by ice. All these descriptors characterize the ice and surrounding waters. With this information, the ship's master knows about conditions and risks that lie ahead and can make informed decisions about how, or if, to proceed. By freeing them from other concerns, SIPAS lets analysts focus on the critical and difficult task of understanding the ice conditions they see. For example, preconfigured constraints built into the attribute coding tools help ensure quality of the data. Map topology rules are in place so that splinters or overlapping polygons aren't created. 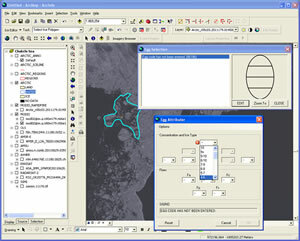 Additional quality checks verify that an area's delineated regional boundary edges and attributes match polygons already created in neighboring regions. 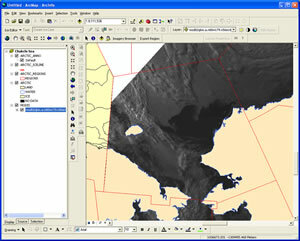 Digitized polygons are directly input to NIC's enterprise geodatabase. In 1999, Semeon Sertsu, the center's director of information technology, committed NIC to using GIS because it had the greatest capacity to meet the center's needs. 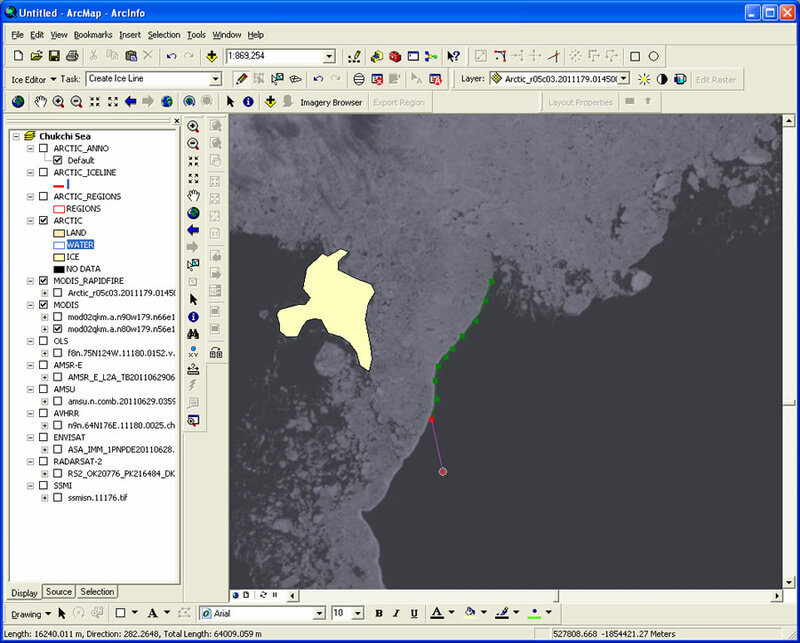 "It was worth the effort, because today, ArcGIS is providing us with wonderful data management, image analysis, output, and dissemination capabilities," Sertsu said. "It is delivering more than I had originally imagined. For instance, we have a GIS tool that can perform a routine in about 30 seconds that once took us a week to do." Professionals such as ice analyst Brian Jackson are assigned to analyze a specific area. Using the graphic, menu-driven Image Browser, Jackson selects the best satellite imagery and brings it into the SIPAS work environment. He then manually analyzes the images using heads-up digitizing to draw boundaries of specific ice types. "It easily manages the data," said Jackson. "I don't have to transfer data between systems. 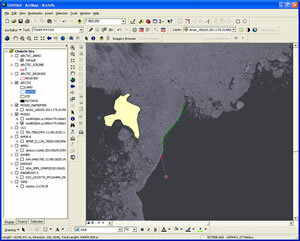 I can draw a line in ArcGIS and share it in the exact same file so there is no loss of clarity. One aspect of the software that I particularly find amazing is that I can be working on an Arctic polar section, click an icon, and within 20 seconds access Antarctic real-time satellite data within the same desktop environment." Although Jackson sees polar regions changing, he will not venture an opinion as to whether this is caused by climate change, nor will anyone else at NIC. The analysts leave this issue to the scientific community. However, they said that there are notable changes in the northern sea route (along the Asian coast north of Siberia), which in 2011 was open for four weeks—the longest period in NIC's 40 years of analysis. This creates opportunity for surrounding nations to develop shipping, fishing, and natural resource enterprises. Sertsu has been working with a committee to get nations located around the poles to share their polar data for collaboration. "Nobody knows their own backyard better," he said. "If nations agree to this idea, they will have a comprehensive polar map. Working together on such a map may well lead them to work together as a global community to address polar ice cap concerns."